With regular features on leisure homes, lodges and holiday homes, camping and glamping, motorhomes and tourers, there’s something for everyone within, whatever your budget! Buy a single copy or subscription to Holiday Living magazine. From short stays to holiday home ownership, quirky one-off breaks and features showing how to get the most out of your free time, Holiday Living is all about enjoying life more and making the most of every holiday opportunity. 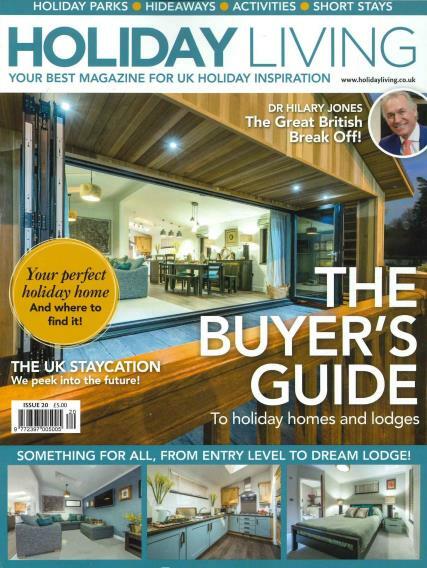 We’ll be popping some of the most beautiful UK holiday park destinations under the spotlight, going behind the scenes to find out all the best-kept secrets from those in the know. A subscription to this diverse and fascinating Holiday Living magazine will not only keep you up-to-date on all the latest exciting holiday innovations, but it will also inspire you ready to book your next break. The added bonus is that reading it will make you feel like you’ve had a mini-break all from the comfort of your own armchair!